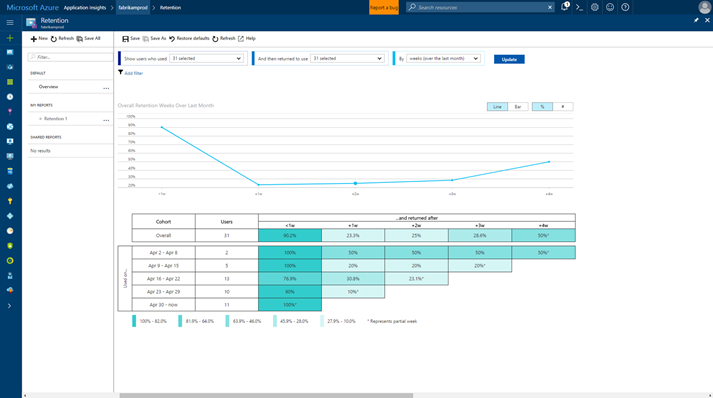 Application Insights has new tools to empower your development team to better understand how customers use your web apps. 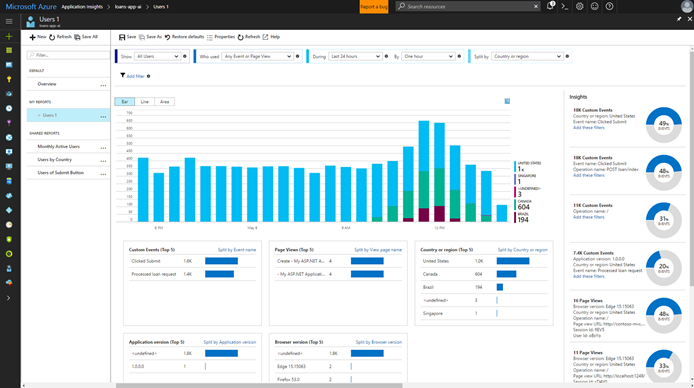 These tools are available as a preview today in Application Insights in the Azure Portal. Track business metrics related to your application, like retention and your number of active users. Investigate increases or decreases in usage from new versions of your app, certain browsers, or certain countries. Better design new pages and features with insights into current user behavior. Identify pages and features in legacy systems that are rarely used, which might be safely removed. Demonstrate the business value of your app within your organization by showing its impact on customers or other users. How many daily active users does your app typically have for some set of events that your team considers “active usage”? How many users tried a new feature of your app? What countries, browsers, and operating systems bring the most traffic to each page of your site? How many sessions does the average user spend interacting with certain features? How many times has a certain page of your app been viewed, split by different A/B experiment groups your team has set up? Once you find an interesting insight about your users, you can save it as a report so you can share it with the rest of your team. Anyone with access to the same Application Insights resource will see it in the Saved Reports section of the tool. With these new tools, the existing Usage blade in Application Insights is being deprecated. For all the same information, check out the Overview report that comes saved by default in the Users tool. Learn more about the Users, Sessions, and Events tools. Often, the fastest way to increase the usage of your app is to better retain your existing customers, rather than acquiring new customers. With a single click, the new Retention tool shows how many people that used a feature on a certain day or week came back to use a feature in subsequent days or weeks. This is especially useful to understand the effectiveness of new features, content, or marketing in increasing retention. By comparing cohorts of users on days before and after new efforts are made, your team can learn what works and what doesn’t, then iterate to make progress. Learn more about the Retention tool. The Users, Sessions, Events, Retention, and User Groups tools are available in the resource menu of each Application Insights resource in the Azure Portal.